Itâ€™s a common myth that geeks and gadget lovers lead and incredibly unhealthy lifestyle, sure we spend many many hours ploughing through tech news, gadget blogs and of course demolishing enemyâ€™s in our favourite shoot, em up. However, a new group of people are starting a love affair with technology. These people are fit, active and love the outdoors as much as watching their favourite podcast on their tablet or phone. 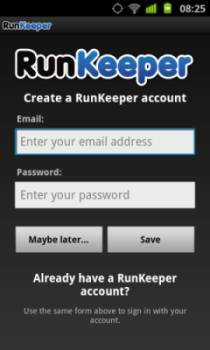 One of the most popular apps across both Android and iOS is Runkeeper. This is a realtime GPS activity tracker for your phone. It is a great way to log, manage and improve your fitness. It helps you become more competitive by constantly pushing you to beat previous activities. So that's the basics of the App and the genre, now on to the review. The app is available free on Android, you can get it direct from the Android Market Place or Amazonâ€™s App Store. Once you have downloaded and installed the app setting it up is very easy and straight forward. One word of warning though spend some time setting it up prior to completing your first activity as the default settings might not be what your after, particularly it tracks in Miles, most people I know all track in KM and once you start the activity you can't alter this until you save that activity. The first screen prompts you to enter some details to create an account, this is not absolutely necessary as you can still track and record your activities however without am account you will not be able to take advantage of the more in-depth analysis tools within the run keeper.com website, which is again free for basic use. One you are logged in as I mentioned above make sure you have gone through and set your preferences, some of the options to be mindful of are metric or imperial units for distance and also very importantly the voice prompts. Some of the guys I know who train with Runkeeper love the voice prompts, they claim they motivate them throughout their activity, I on the other hand find them pretty annoying. However like all good apps you can suit them completely to you own requirements, you can have voice prompts spoken to you at intervals of either time or distance, for example every 5 minutes or every KM. I would have personally like to have seen prompts available at much more spaced out periods, particularly for distance, maybe every 5k would have been perfect. You can also choose what to have shown on the main application screen whilst the activity is in progress, being able to choose between either pace or speed is a nice touch. When I first looked at the main running screen I thought it looked very sparse and unintuitive however after use you can see the reason for keeping it simple really works, again most people I know rely on the voice prompts more than the screen anyway. The main screen consists of a timer, this shows elapsed time and is very clear and easy to read even whilst running. There is also then a great graph along the middle which shows your pace for the previous minute. This is then updated for every minute of the run, plus you can scroll back through them giving you an instant visualisation of your run, great for seeing where you speed up or slow down during your activity. There is also a small map icon, which when pressed takes you to the google map layout. This is then overlaid with markers every mile or KM depending on your preference. This is a nice addition to the app although I find this better viewed from the Runkeeper.com website. None the less a nice touch. There is also a big social element to Runkeeper which is another source of motivation if you are into sharing your activities, either to show off or get some encouragement if you are finding things hard going. You have the ability to share to either Facebook or Twitter, plus individually email people. The last option is share with other Runkeeper friends or the Runkeeper Community as a whole. A really great feature of sharing and syncing with Runkeeper is that if you change or lose your device you can sync your activities back to your phone. Once you have set everything up and completed your activity you can save the activity, so you could maybe log the weather, kit used or any friends that may have tagged along. This is great to serve as a reminder of the activity so you can once again track what works for you, maybe you run better in the heat. This app will help you decipher the data. Seeing as this is an App review I wonâ€™t go into detail on the Runkeeper website too much, suffice to say it offers a great source of both free and paid content to help you with your activities. In summary, I was running version 2.9.0.2 on a Samsung Galaxy S2 using Cognition v1.5 Custom ROM. Performance on the app was snappy and I experienced no lag at all. I started the activity with 100% battery and used 6% during a 42:10 minute 5 mile (8.24km) run with 5 minute voice prompts and regular screen viewing to check my progress , thus giving you more than enough time for the vast majority of people. I am sure this would get me through a marathon without too much trouble.